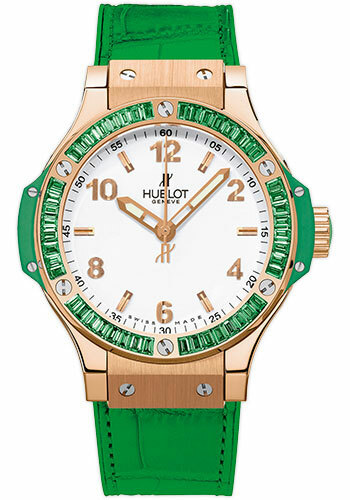 38mm 18K red gold case, 18K red gold bezel set with 48 tsavorite baguettes, green composite resin lateral inserts and bezel lugs, white dial, quartz HUB 2900 movement, green rubber and gummy alligator strap with deployant buckle. Water resistant to 100 meters. 38mm 18K red gold case, 18K red gold bezel set with 48 blue topaz baguettes, blue composite resin lateral inserts and bezel lugs, white dial, quartz HUB 2900 movement, blue rubber and gummy alligator strap with deployant buckle. Water resistant to 100 meters. 38mm 18K red gold case, 18K red gold bezel set with 48 orange sapphire baguettes, orange composite resin lateral inserts and bezel lugs, white dial, quartz HUB 2900 movement, orange rubber and gummy alligator strap with deployant buckle. Water resistant to 100 meters. 38mm 18K red gold case, 18K red gold bezel set with 48 pink sapphire baguettes, pink composite resin lateral inserts and bezel lugs, white dial, quartz HUB 2900 movement, pink rubber and gummy alligator strap with deployant buckle. Water resistant to 100 meters. 38mm 18K red gold case, 18K red gold bezel set with 48 amethyst baguettes, purple composite resin lateral inserts and bezel lugs, white dial, quartz HUB 2900 movement, purple rubber and gummy alligator strap with deployant buckle. Water resistant to 100 meters.